The Eurasian Patent Office continued strengthening and advancing the Eurasian patent system in 2017. Reach broader audiences using the Eurasian patent system. The Eurasian Patent Office's focus on building the Eurasian industrial design protection system established a new modality of international cooperation where learning the industrial design protection experience of national IP Offices in the region, other patent offices and the World Intellectual Property Organization (WIPO) was the first step. The management established an integrated working group composed of Contracting States’ representatives, who held a video conference in November 2017 focused on the immediate initiatives, such as putting in place a legal framework to govern the industrial design protection in Eurasian space. Cooperation gained a new momentum as a result of a fast track examination procedure introduced for inventions. The Memoranda of Understanding on the Patent Prosecution Highway (PPH) Pilot Program, signed in 2017 with the European Patent Office (EPO) and the State Intellectual Property Office of the People’s Republic of China (SIPO), enable inventors to obtain patents faster and more efficiently and to benefit from fast-track patent examination procedures at EPO and SIPO based on the Eurasian Patent Office work products. Further EAPO promotion initiatives for reaching out to a wider range of Eurasian patent system audiences resulted in new cooperation agreements achieved in 2017 with government and professional organizations of Germany, Italy, Georgia, China, South Korea and Japan, with residents of 122 countries now becoming users of the Eurasian patent system over the years. Overall, Eurasian Patent Office professionals participated in 94 international cooperation events, with 41 of those shared by the EAPO President. A landmark in advancing international cooperation was a regional seminar called “Patent Landscapes” hosted by the Eurasian Patent Office in the EAPO headquarters, 15-16 May 2017, as part of the spring series of training events for professionals from EAPC Member States national IP Offices. In addition to the World Intellectual Property Organization and the European Patent Office as committed partners of the Eurasian Patent Office for education programmes, the seminar and the ensuing roundtable discussions drew participation from representatives of Rospatent’s Federal Institute of Industrial Property (FIPS), the State Intellectual Property Office of the People’s Republic of China and the Skolkovo IP Center. The seminar participants looked at current methodology trends in patent information analysis based on statistical data processing, latest data analysis visualisation tools as well as specificities and strategies of patenting in individual upswing technologies. EAPC Member State participants in the seminar gave an overview of the patent statistics and analysis tools they use at home. 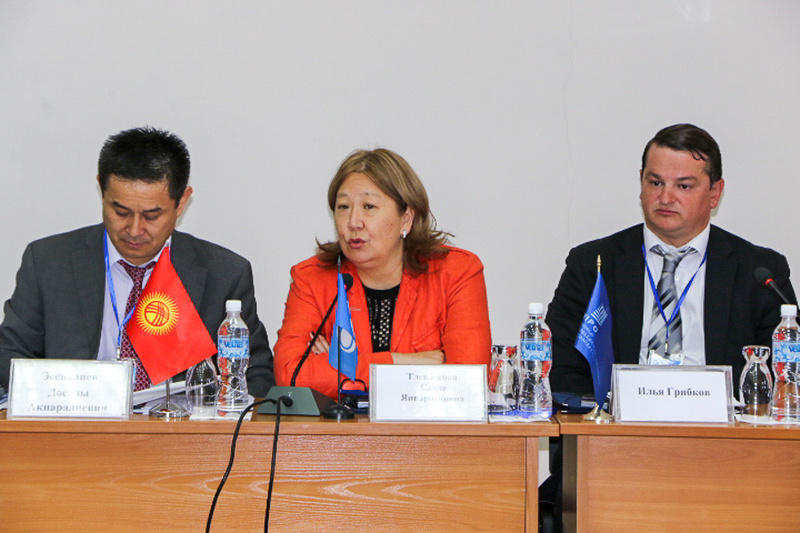 The Kyrgyz Republic hosted a regional seminar on Lake Issyk-Kul, 4-5 July 2017, to focus on patent analysis. Organized by WIPO, EAPO and the State Service of Intellectual Property and Innovation under the Government of the Kyrgyz Republic (Kyrgyzpatent), the event draw attendance from all the EAPC Member States as well as the IP Offices of Moldova, Uzbekistan, Estonia, government agencies, enterprises and industry associations of the Kyrgyz Republic. EAPO President S. Tlevlessova led the Eurasian Patent Office delegation and made an opening address at the seminar. The Eurasian Office participants spoke in detail about the EAPO approach to preparing and using patent statistics as well as the patent analytical capability of the Eurasian Patent Information System (EAPATIS). Professionals from WIPO, Rospatent and One World Analytics (UK) shared their experience in patent research and in creating patent landscapes. The Eurasian Patent Office organizes and holds special events in observance of World Intellectual Property Day, landmarks in IP history and national days in Eurasian patent integration countries and deems it as an important international cooperation commitment. The International Forum “Intellectual Property in the 21st Century” is among Russia's major and traditional discussion platforms for World IP Days. The organizers include the Russian Federation Chamber of Commerce and Industry, the Council of Federation of the Federal Assembly of the Russian Federation, Rospatent, the Ministry of Education and Science of the Russian Federation, the Ministry of Industry and Trade of the Russian Federation, the Intellectual Rights Court and others. The Eurasian Patent Office shared the organization of the 10th International Forum themed “Innovations for a Higher Quality of Life”, a jubilee event held in Moscow, 25-28 April 2017. A member of the forum organizing committee, EAPO President S. Tlevlessova made an address to a plenary session. Eurasian Office representatives participated in a thematic conference held at the International Trade Center to explore topical issues of commercializing intellectual property subject matters and their enforcement in modern life. 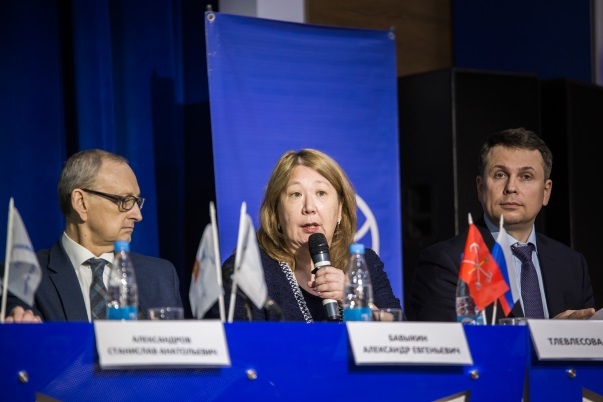 EAPO President S. Tlevlessova made an opening address to the international conference “Russian Intellectual Capacity: Legal and Resource Support” held in St Petersburg, 18 April 2017, timed to coincide with World Intellectual Property Day, observed as a special city-wide annual event as part of an IP days programme. The IP days are also an important occasion for IP awards. A relevant special event was held in the Kyrgyz Republic on 26 April 2017 when the republican deputy premier awarded a V.I. 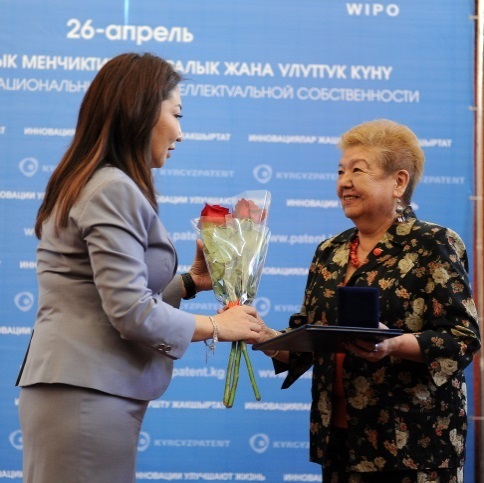 Blinnikov Gold Medal “For Promoting Invention and Patent Practice” to Ms Zh.B. Bapanova, Director, Republican Children’s Engineering and Technical Academy "Altyn Tuiun". As part of the republican seminar on law and practice in commercializing R&D results held in Minsk, Republic of Belarus, 4-5 May 2017, timed to coincide with the quarter-of-a-century celebrations of the Belarus IP system, EAPO Vice President L.I. Voronetsky awarded a V.I. Blinnikov Gold Medal “For Promoting Invention and Patent Practice” to the Joint Institute of Mechanical Engineering of the National Academy of Sciences of Belarus. The 25-year celebrations of the national patent authority and the establishment of the industrial property protection system in the Republic of Kazakhstan proved a special occasion in the republican capital city of Astana, 13-14 September. 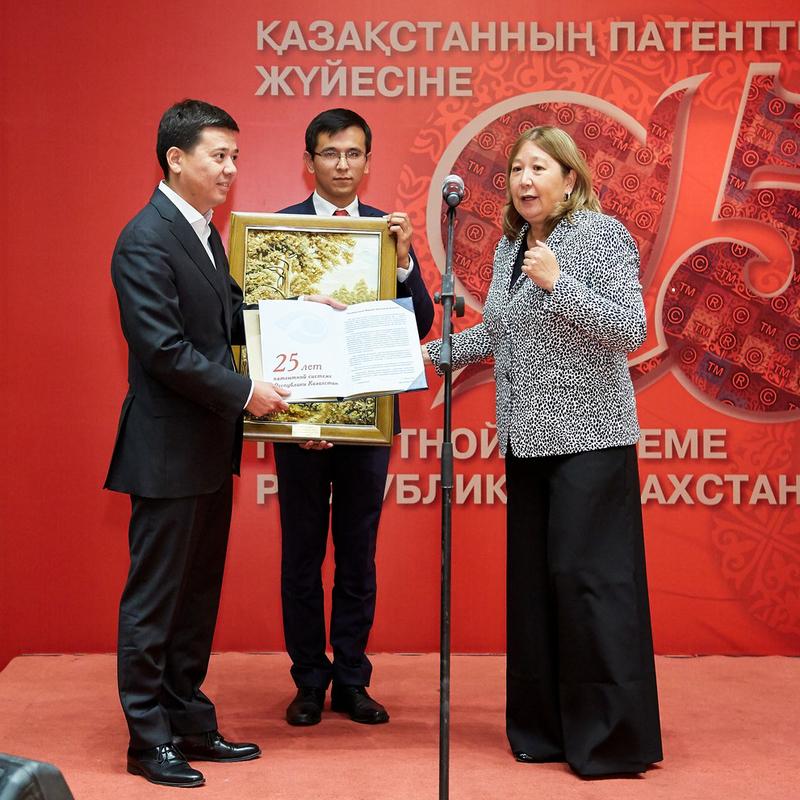 The celebrations continued into a festive evening attended by representatives of national IP Offices, international organizations, government agencies, business communities, IP thought leaders and patent attorneys of Kazakhstan. EAPO President S. Tlevlessova made laudatory remarks and presented Mr M. Beketayev, Minister of Justice of the Republic of Kazakhstan, with a congratulatory letter and a souvenir gift. EAPO President S. Tlevlesova attended a state reception hosted by the Embassy of Turkmenistan to Moscow on 27 October 2017, marking 26 years of Turkmenistan's independence. Congratulations to the Turkmenian people on the significant landmark came from attending Russian MPs representing the lower and upper chambers of the Russian parliament, high-ranking officials from the Russian Ministry of Foreign Affairs, foreign diplomats accredited to Moscow, Turkmenian and Russian businessmen, public organization leaders, academics, artists, journalists and representatives of Turkmenian expatriate communities in Russian regions. EAPO top-level executives attended the most significant international IP fora and festivals in Russia and Kazakhstan in 2017. 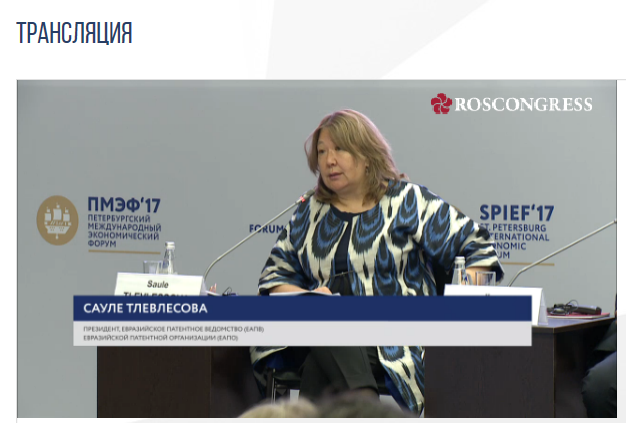 On 1st June 2017, EAPO President S. Tlevlesova made a presentation on innovative development and intellectual property protection in the digital economy at a panel session of the St Petersburg International Economic Forum. The EAPO President mentioned the efficiency of regional patenting systems leveraging timely and economical cross-border technology transfer and the importance of a strong patent as an investment protection tool. Also, the EAPO President spoke about the operation of IP Offices in a digital environment and efforts made at global, regional and IP office level to streamline the patent procedures and to enhance the timeliness. On 17 May 2017, EAPO Vice President L.I. 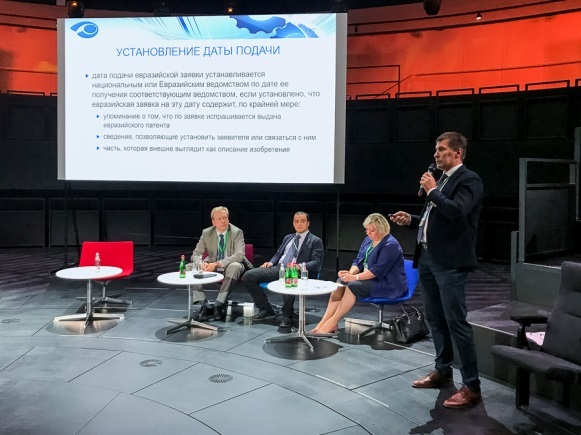 Voronetsky participated in a Rospatent-brokered discussion of legal aspects of technology transfer from ideas to innovations at the St Petersburg International Legal Forum. The session drew participation of Russian government executives and lawmakers; WIPO, EPO, Eurasian Economic Commission representatives; Russian and foreign business corporations, organizations and associations engaged in technology transfer and intellectual property protection. EAPO President S. Tlevlessova participated in the International Forum on Integration Between Science and Business, Astana, Kazakhstan, 30 June 2017, in the vein of the “Energy of the Future” EXPO 2017. The event was hosted by L.N. Gumilyov Eurasian National University, an academic establishment awarded a V.I. Blinnikov Gold Medal, EAPO’s highest award. EAPO President S. Tlevlessova met with Ms E. A. Azimova, Deputy Minister of Justice, Republic of Kazakhstan, in the sidelines of the forum to discuss the advancement of bilateral cooperation in intellectual property. 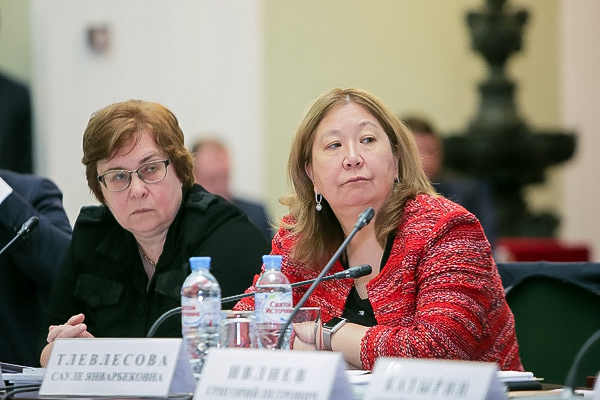 Led by EAPO President S. Tlevlessova, the Eurasian Patent Office delegation took part in a Rospatent-brokered seminar to look at the development of infrastructure for commercializing intellectual property and to discuss regional systems for intellectual property registration. The fifth trilateral event between Russia, China and Mongolia was held in Vladivostok, Russian Far East, 6 September 2017. Overall, the seminar drew the attendance of IP Office delegations from Russia, China, Mongolia, Japan External Trade Organization (JETRO), leaders and specialists from IP Offices of such EAPC Member States as Azerbaijan, Armenia, Belarus, Kazakhstan, Kyrgyzstan and Tajikistan. As part of a discussion of integration and stronger economic ties within Eurasia EAPO President S. Tlevlessova made an overview of the Eurasian patent system, benefits of regional patenting, statistics of EAPO patent grants to Chinese and Mongolian applicants and bilateral cooperation with IP Offices attending the seminar. 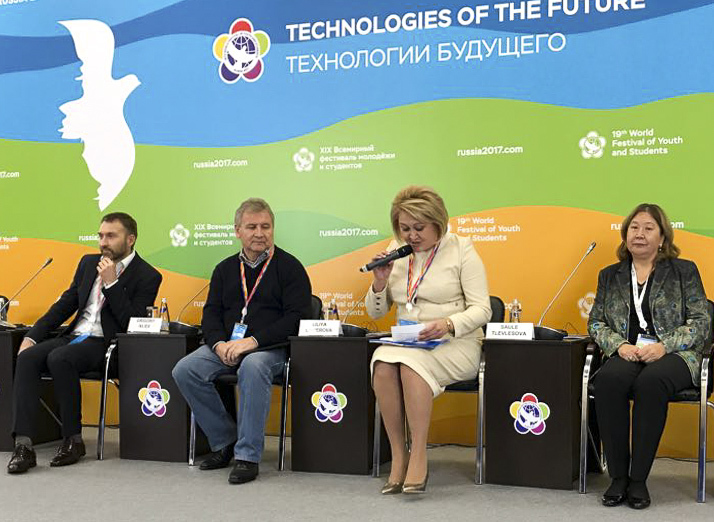 On 19 October 2017, EAPO President S. Tlevlessova participated in the International Research-to-Practice Conference “21st Century: Young Intellect”, Sochi, Russian Federation, as part of the XIX World Festival of Youth and Students, which is an important discussion forum for young people between 18 and 35 years of age. The conference followed the guidelines of the “Energy of the Future” festival. Its organisers were the Russian Federation Council and Moscow Bauman State Technical University in team with the Russian Ministry of Education and Science, WIPO and Rospatent. As an expert, the EAPO President engaged with the audience at the young innovators’ project contest in the sidelines of the conference. At the panel session, she talked to young students about viable strategies for protecting their ideas, inventions and technologies. Also, the EAPO President spoke about useful aspects of patenting and protection of inventions as production know-how; she mentioned drivers of patenting decisions and gave an economic dimension to patent protection. A new modality of cooperation between the EAPC Member States was inspired by the resolution of the EAPO Administrative Council at its thirty-third session (6-7 November 2017) to implement the initiative of the Eurasian Patent Office to explore possibilities for establishing an EAPO-based legal protection system for the industrial designs. A relevant Working Group had its kick-off videoconference meeting on 17 November 2017 to do groundwork for the establishment of a Eurasian legal protection system for the industrial designs. 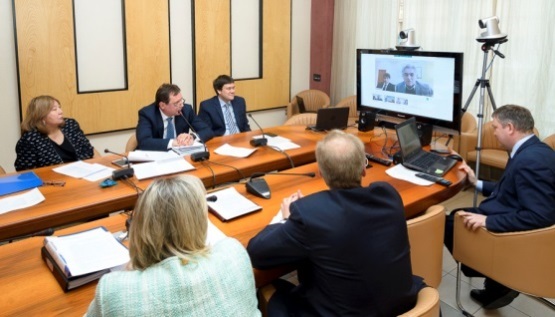 The videoconferencing EAPC Member States included Armenia, Belarus, Kazakhstan, Kyrgyzstan, Russia and Tajikistan, plus Eurasian Patent Office participants of the session. After her opening address, EAPO President S. Tlevlessova briefed the audience on the main project objectives and expected outcomes. The meeting participants discussed practical arrangements for the Working Group operation, the timeline for drafting a Eurasian Industrial Designs Convention and other standard-setting documents for leveraging industrial design protection in Eurasian space. As an observer on the Interstate Council on the Issues of Legal Protection and Enforcement of Intellectual Property (MGSIS), the Eurasian Patent Office attended the MGSIS sessions in the reported year. EAPO Vice President L.I. Voronetsky participated in the sixth MGSIS meeting in Moscow, 19 May 2017. Also in attendance were plenipotentiaries of the MGSIS Member States, CIS Executive Council, WIPO officers and representatives of the Russian State Academy of Intellectual Property (RGAIS). The session agenda included, inter alia, a Draft Agreement on Building and Promoting a CIS Market for Intellectual Property and the RGAIS Annual Report for 2010-2016. Commercial-scale release of the CIS countries’ regional patent information product on CD-ROM stood out as a project of added focus. Following the deliberations, the session resolved that such kind of distribution of patent documents on CD-ROM should be ceased and information products be thenceforth disseminated via an Internet server. As a party to the project, the Eurasian Patent Office had financed annual expenditure incurred (since 2009) in the production of CISPATENT discs as an entity processing patent documents from national IP Offices of EAPO Member States party to project. 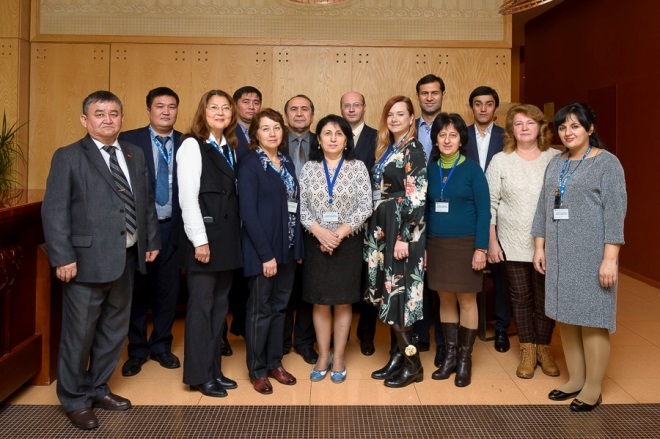 Eurasian Patent Office representatives share Project Coordination Council sessions. Attended by delegations from Belarus, Russia, Tajikistan and the Eurasian Patent Office, the Coordination Council meeting, hosted by Rospatent, took place on 28-29 March 2017. Eurasian Patent Office representatives took part in the seventh MGSIS meeting in Moscow on 29 September 2017, where the participants continued discussing the legal framework underlying the MGSIS Member States' collaborative efforts in the protection and enforcement of intellectual property. The Eurasian Patent Office relied on the established bilateral ties and on EAPO Administrative Council's resolutions in promoting its cooperation with countries of Eurasian patent integration in 2017. Rospatent hosted regular meetings on 28 February and 29 August 2017 of the IT cooperation joint working group (established in 2016) with a focus on technicalities of peer-to-peer system communication between the Eurasian Patent Office and the Federal Institute of Industrial Property (FIPS) for the transfer to the EAPO of Eurasian applications filed with Rospatent and for data exchange in processing requests for patent search reports on Eurasian applications. The data exchange platform had a test run at year-end. The transition to electronic communication is scheduled for 2018. 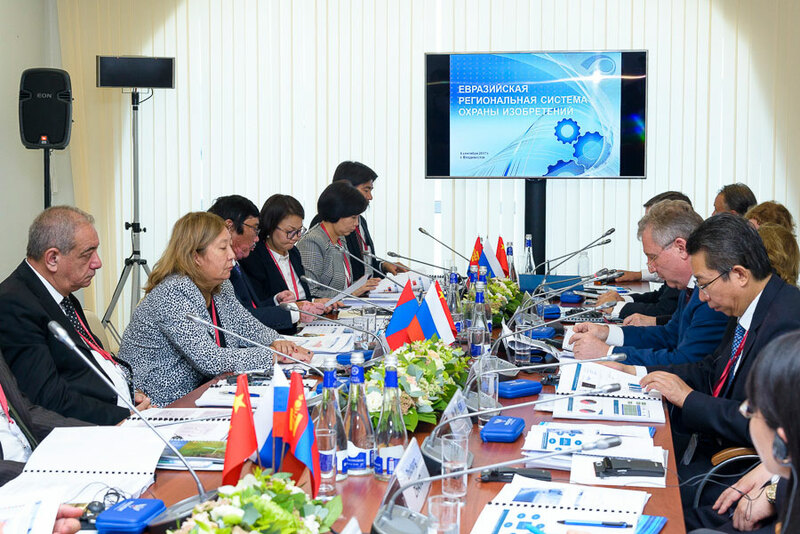 The joint working group sessions developed a roadmap for connecting the Eurasian Patent Office to Rospatent's PatSearch. On 22 March 2017, Rospatent’s FIPS representatives demonstrated the base functionality and key operation stages of the search system at the Eurasian Patent Office. Subsequently, the two parties signed a relevant agreement formalising the Eurasian Office access to the system. 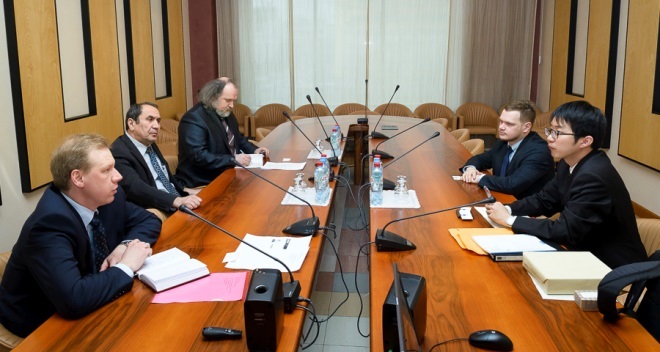 On 21 November 2017, EAPO hosted a meeting in its headquarters between the Eurasian Patent Office and a delegation of the Centre for Information Technologies and Systems for Executive Branches of Power (CITIS) reporting to the Ministry of Education and Science of the Russian Federation. Initiated by the Russian party, the meeting focused on the development of data exchange between the Eurasian Office, Rospatent's FIPS and the CITIS to underlie patenting of Russian inventions under the Eurasian patent procedure. Following the meeting, software engineers of the parties looked at the technicalities involved, i.e. data structure, data presentation formats and data exchange protocols. Learning Rospatent's best practice in developing industrial design examination and registration as a stand-alone service line has evolved into a new modality of cooperation for the Eurasian Patent Office committed to building a framework for a future industrial design legal protection system in Eurasian space. The reported year saw a number of EAPO-initiated meetings with Rospatent's FIPS. Thus, the Eurasian Office hosted a working session with the FIPS on 26 October 2017 to discuss practical arrangements for FIPS-managed industrial design examination, including data search and workflow management for industrial design application filings. Rospatent hosted a working meeting on 16 November 2017 to share the experience in maintaining a register for industrial design patents. Another focus of the session was the disclosure of information on industrial design patent grants in Rospatent's official publications and the grant of the title of protection. The Eurasian Office specialists took stock of the changes in Rospatent operations ensuing from the Russian Federation’s accession to the Hague Agreement Concerning the International Registration of Industrial Designs. To reciprocate, the Eurasian Patent Office representatives shared their experience with the FIPS colleagues in electronic workflow management of filings for Eurasian invention applications, legal data publications and Eurasian patent register maintenance. The Eurasian Patent Office hosted a meeting with Rospetent's leader G.P. Ivliev on 24 October 2017 to discuss the development of a Eurasian legal protection system for industrial designs and to address current issues of cooperation between the Eurasian Office and Rospatent. Following a brief working meeting with EAPO President S. Tlevlessova, Rospatent's leader G.P. Ivliev, Chair, EAPO Administrative Council, was awarded an EAPO Merit Badge for his contribution to consolidating and advancing the Eurasian patent system. In his address to the Eurasian Patent Office staff, G.P. Ivliev expressed his profound appreciation of the amount of collaborative work done by the two agencies and noted the professionalism of the Eurasian Office team. The reporting year 2017 saw a series of meetings between EAPO President S. Tlevlesova and Ms E. A. Azimova, Deputy Minister of Justice, Republic of Kazakhstan, in the sidelines of the Astana-hosted International Forum on Integration Between Science and Business, WIPO Assemblies and sessions in the EAPO headquarters. The two leaders discussed the advancement of bilateral cooperation. EAPO President S. Tlevlesova and Rospatent's leader G.P. Ivliev met with the team of the Almaty branch of the National Institute of Intellectual Property (NIIS), Kazakhstan, on 3 July 2017. The discussion tackled the use of Rospatent's FIPS PatSearch and EAPATIS, a Eurasian patent information search and retrieval system, as well as prospect for NIIS experts to benefit from training seminars and training on the job. EAPO President S. Tlevlessova met with Mr D.A. Esenaliev, Chairman, State Service of Intellectual Property and Innovation under the Government of the Kyrgyz Republic (Kyrgyspatent), in the course of a regional seminar on Lake Issyk-Kul, Kyrgyz Republic, 4-5 July 2017. The two leaders discussed current issues of their bilateral cooperation. In pursuance of the resolution adopted by the thirty-second session of the EAPO Administrative Council, 1-3 November 2016, relevant signatures were affixed in Chisinau, Republic of Moldova, 22 August 2017, to the Protocol of Amendments to the Agreement Between the Eurasian Patent Organization and the Government of the Republic of Moldova on Legal Protection of Inventions in the Territory of the Republic of Moldova Past the Eurasian Patent Convention Denunciation by the Republic of Moldova, executed at Chisinau, 12 April 2012. The Protocol amends the split of the maintenance fees for Eurasian patents valid in the territory of the Republic of Moldova payable to the Eurasian Patent Office and the State Agency of Intellectual Property of the Republic of Moldova (AGEPI). The year 2017 saw further advancement of IP staff education programmes to benefit national patent offices of states party to the EAPC as one of the major collaborative work commitments within the Eurasian Patent Organization. EAPO continued to finance expenditure on training staff for national IP Offices of states party to the EAPC at the Russian State Academy of Intellectual Property (RGAIS) in the reporting year. Specifically, 18 specialists from national IP Offices completed professional development courses in intellectual property and patenting. Another 3 specialists were trained in law at the RGAIS to align skills with needs at home. Specialists from national IP Offices of EAPC Member States benefited from two rounds of customised training at the EAPO headquarters throughout 2017. Conducted 15-26 May 2017, the first round of such tailored training focused on the Eurasian patenting system, EAPO approach to examination of inventions in chemistry, medicine and biotechnology, plus patent landscapes. The audience included examiners and specialists from national IP Offices of all the EAPC Member States. Instructors for specialist subjects in the programme were recruited from structural divisions of the Eurasian Patent Office, the World Intellectual Property Organization and the State Intellectual Property Office of the People’s Republic of China. Those included Mr L. Mailänder, Head, Cooperation in Examination and Training, PCT International Cooperation, WIPO Patents and Technologies, and Mr H. Peng, SIPO chemistry expert. The audience became familiar with different aspects of the Eurasian patent procedure, basics and aspects of application examination related to organic chemistry, polymeric materials, pharmaceuticals, antibodies and biotechnology. The trainees benefited, too, from an overview of the performance of other industrial design offices in using examination results. 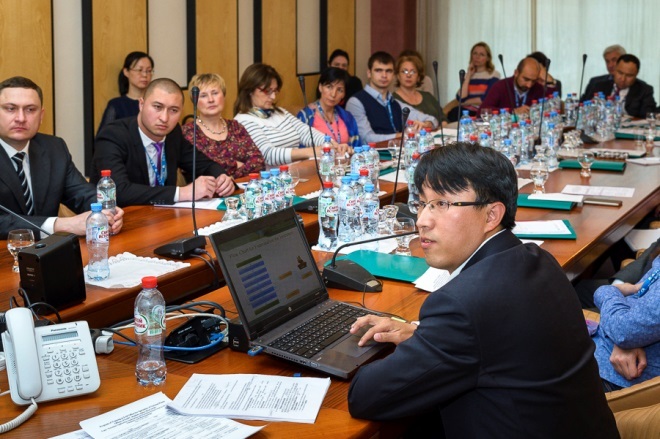 Also, the training programme included a seminar on patent landscapes, 15-16 May 2017, and training on the job in structural units of the Eurasian Patent Office’s Examination Department. The second round of the training (25 September through 6 October 2017) focused on Eurasian application examination and Eurasian patent grants in mechanics, physics and electrical engineering. 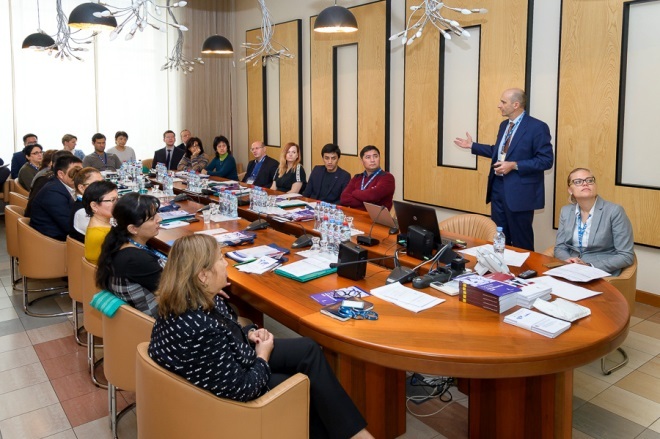 The autumn training sessions drew participation from specialists and examiners from seven national patent offices of the EAPC Member States: Azerbaijan, Armenia, Belarus, Kazakhstan, Kyrgyzstan, Russia and Tajikistan. EAPO President S. Tlevlessova made an opening address. 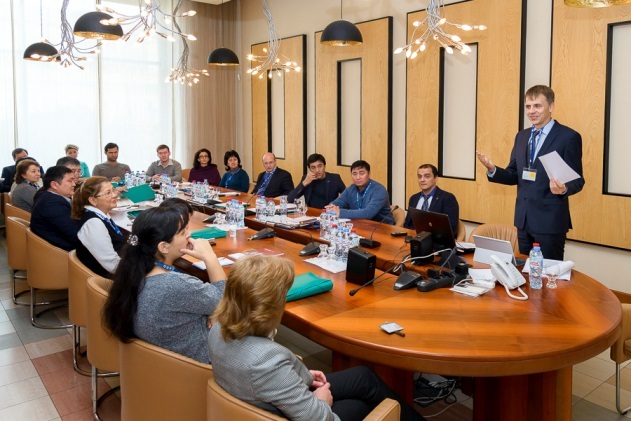 The audience took advantage of the theory and exercise sessions conducted by leaders and specialists of the Eurasian Patent Office and visiting instructors from WIPO and EPO. Eurasian Office specialists gave a detailed explanation of the fundamental principals of the Eurasian Patent Law and specificities of examining Eurasian applications in mechanics, physics and electrical engineering. Procedures for appealing examination decisions, challenging the Eurasian patent validity and the Eurasian patent limitations were also addressed in the course of training. WIPO's Mr P. Waring, Head, PCT Technical Cooperation, PCT International Cooperation, Patents and Technologies, and Ms O. Novikova, Assistant Expert, PCT4 Task Group, PCT Services, Patents and Technologies, gave the trainees an overview WIPO's information resources under the PCT and looked specifically at ePCT as a portal for patent offices and a system for electronic filing of international applications, plus PATENTSCOPE. Mr P. Skorovs, an EPO patent examiner, delivered a series of training sessions on the examination of applications in the field of medical equipment, including EPO practice in evaluating the patentability of such high technology inventions as ‘combined pharmaceuticals’, or medical devices containing pharmaceuticals. Also, the audience benefited from an overview of the Cooperative Patent Classification (CPC) system and its patent search capability based on medical technology as an example, plus patent search strategies in this field. The specialists of national IP Offices of the EAPC Member States were issued relevant certificates upon the completion of their training programme. 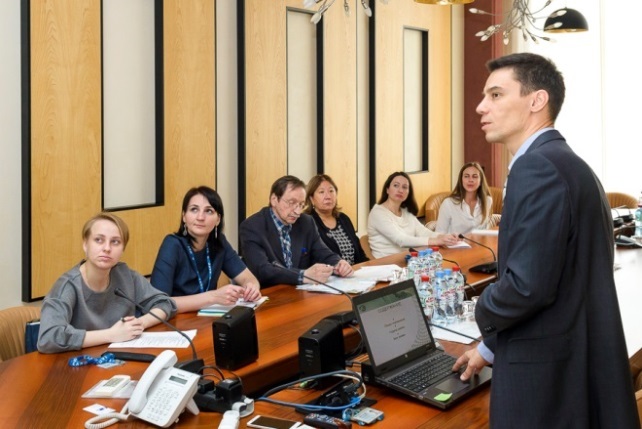 Every year, the Eurasian Patent Office retains specialised training centres based in Moscow for career and professional development courses to benefit IT staff from national patent offices of states party to the EAPC. The Eurasian Office tapped into the resources of the SoftLine Education Centre for a Microsoft Exchange Server 2016 Administration course (11-15 December 2017) as part of continued professional development (CPD) of staff from the IP Offices of Azerbaijan, Armenia, Belarus, Kazakhstan, Kyrgyzstan, Russia, Tajikistan and the Eurasian Patent Office. The CPD course target audience was IT staff administering and setting up computer mail and instant messaging systems running on Exchange Server 2016 software. The training participants were issued relevant CPD certificates upon the completion of the course. The Eurasian Patent Office views its engagement in intellectual property education programmes as an important driver of its international cooperation strategy and a tool for raising public awareness about the benefits of the Eurasian patent system. The year 2017 saw dynamic collaborative work in this area with the Skolkovo Innovation Centre in addition to RGAIS and WIPO. As part of a Visiting Patent School in the Russian Far East organized in Vladivostok, 25-May 2017, a Eurasian Patent Office representative made a presentation on the benefits and efficiencies of the Eurasian patent and spoke about the advantages of patenting with the EAPO. Other presenters included specialists from WIPO, patent offices of Japan, China, Korea, Rospatent's FIPS, Russian Export Centre and Skolkovo Foundation. EAPO President S. Tlevlessova participated in the ceremony of awarding the winners of the International IP Olympiad, 26 April 2017, organized for high school students as part of the 10th International Forum themed “Innovations for a Higher Quality of Life”, Moscow 25-28 April 2017. EAPO Vice President L.I. Voronetsky attended the graduation ceremony for RGAIS students, 23 June 2017. The special event drew attendance of RGAIS professors and instructors, representatives of the Committee of the Federation Council for Science, Education and Culture; the Russian Federation Ministry of Education and Science, the Federal Service for Oversight of Education and Science, Rospatent’s FIPS, the Federal Agency for Legal Protection of Intellectual Activity Results of Special Military and Dual Purpose, the Diplomatic Academy under the Russian Federation Ministry of Foreign Affairs and others. On 14 July 2017, EAPO President S. Tlevlessova participated in the Closing Ceremony of the WIPO Summer School hosted by RGAIS, Moscow. The WIPO Summer School brought together students, post-graduates, university instructors, lawyers, patent attorneys, patent specialists and other professionals from Belarus, Georgia, Kazakhstan and Russia. EAPO President S. Tlevlessova extended her congratulations on completion of the WIPO Summer School course. The 4th Skolkovo Patent School operated in the grounds of the Skolkovo Innovation Centre, Moscow, 13-15 September 2017, with the Eurasian Patent Office being among its partners. EAPO instructors made five presentations on a number of subjects, including Eurasian Patent Organization operations, the Eurasian patent system performance, Eurasian patent procedure stages and Eurasian Office electronic services. As part of the Dubna Young Scientists School for Managing Innovations, Eurasian Patent Office specialists made presentations in the International Conference Hall, Joint Institute for Nuclear Research, Dubna, Russian Federation, 19 through 27 September 2017. The event brought together young people from Azerbaijan, Armenia, Belarus, Kazakhstan, Moldova, Russia and Ukraine. The audience encompassed scientists, inventors, managers and entrepreneurs driving innovation. The sessions focused on developing, delivering and marketing innovative goods and services. A Eurasian Patent Office expert made a presentation at the International Research-to-Practice Conference on Topical Issues of Legal Support for Technology Transfer organized by the Russian State University of Justice in team with WIPO and Rospatent, Kazan, Russia, 31 October through 1 November 2017. The presentation tackled the conclusion of contracts for the alienation of the exclusive right in the invention protected under the Eurasian patent system and legal provisions of some countries party to the Eurasian Patent Convention, such as Azerbaijan, Armenia, Belarus, Kazakhstan, Kyrgyzia, Russia, Tajikistan and Turkmenistan. The speaker drew relevant examples and analysed current approaches to relevant solutions. The Eurasian Patent Office continued its cooperation with the Eurasian patent attorneys and professional organizations of patent attorneys in 2017 aiming to assure the quality of patent attorneys' services and to advance the Eurasian patent procedure enhancing its appeal to the users. 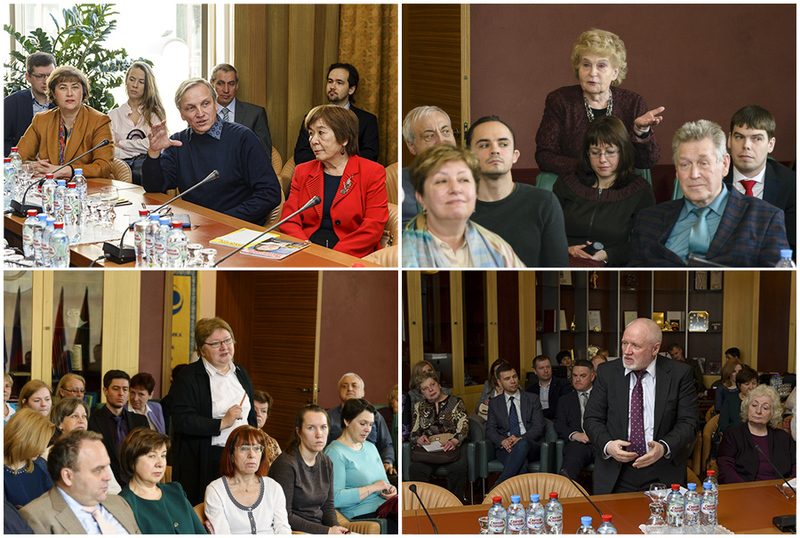 The Eurasian Patent Office hosted a traditional meeting with Eurasian patent attorneys on the eve of World Intellectual Property Day, 25 April 2017. In addition to patent attorneys from Russia, Belarus and Kazakhstan, the meeting drew participation of patent attorneys of EAPC Member States, representatives of Russian IP periodicals, and others. EAPO President S. Tlevlessova moderated the meeting and gave the participants an overview of prospects for the Eurasian Patent Organization advancement. The attending Eurasian Office representatives briefed the audience on the amendments made to EAPO's legal framework and new capability for electronic communication with the Eurasian Patent Office. The participants exchanged views on furthering the Eurasian patent procedure. A Eurasian Patent Office representative took part in the 9th Research-to-Practice Conference “Petersburg Collegial Readings” that took place in St Petersburg, Russia, 28-30 June 2017. Organized by the St Petersburg Patent Bar, the conference drew participants from Russia, Ukraine, Kazakhstan, Belarus, Armenia and the U.S.A. The audience also included representatives of Rospatent's FIPS, WIPO Office in the Russian Federation, RGAIS, editorial boards of The Patents and Licenses and The Patent Attorney. The conference discussed theory and practice of legal protection of intellectual property and intellectual rights. The Eurasian Office representative made a presentation on the extension of the term of the Eurasian patent for pharmaceuticals. 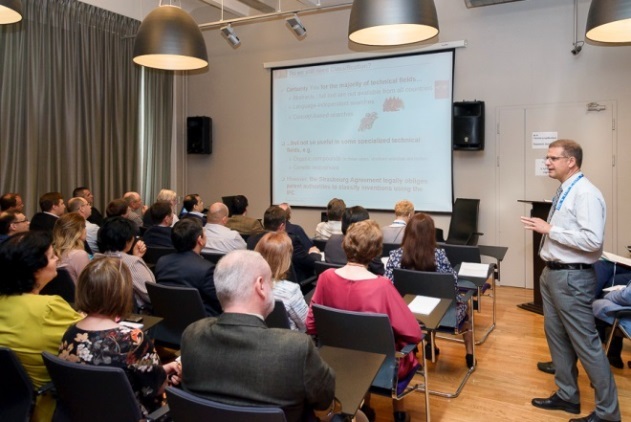 The Eurasian Patent Office ran training seminars, 13 April and 18 September 2017, for Eurasian patent attorneys and other interested parties on the use of the EAPO information systems and resources, such as EAPO-ONLINE for electronic filing of Eurasian applications and EAPATIS for tapping into the patent information. The Eurasian Patent Office and the NEVINPAT agency of patent attorneys had a working meeting in St Petersburg, Russia, 10-12 April 2017, to look at managing EAPO-ONLINE for electronic document exchange. In the course of annual city-wide celebrations of World IP Day in St Petersburg, EAPO President S. Tlevlessova paid a working visit on 18 April 2017 to ARS-PATENT, an agency of patent attorneys and a long-standing partner of the Eurasian Office, who had been heavily involved in all the R&D and pilot operation stages for ADEPT, the first ever electronic system for filing Eurasian applications. The EAPO President looked at today's performance of the agency. For years on end, Gorodissky & Partners Law Firm, Russia, has been an active supporter of EAPO efforts to promote and advance IP initiatives and the Eurasian system for patenting inventions. Throughout 2017, the law firm executives initiated and brokered a series of meetings between the Eurasian Patent Office and industrial corporations of Germany and the United States, an association of business machine manufacturers and IT system integrators from Japan and patent attorneys from Georgia interested in exploring opportunities of patenting in Eurasian patent integration countries and in acquiring EAPO's patent documentation. As resolved by the EAPO Administrative Council, Eurasian patent attorney V.N. Medvedev, Managing Partner, “Gorodissky & Partners”, was awarded a V.I. Blinnikov Gold Medal “For Promoting Invention and Patent Practice”. The Eurasian Patent Office tackles and discusses prospects for intellectual property advancement and sees it as a commitment in its collaborative action with government and professional agencies of the Russian Federation, a country of origin of the EAPO headquarters. In 2017, EAPO President S. Tlevlessova was added to the Board of Scientific Advisers under the Intellectual Rights Court (IRC), an advisory body missioned to provide scientific rationale and valid rulings that underlie the application of international treaties, law and other legal provisions in developing uniform judicial practice and for making moves to advance IP legal protection. 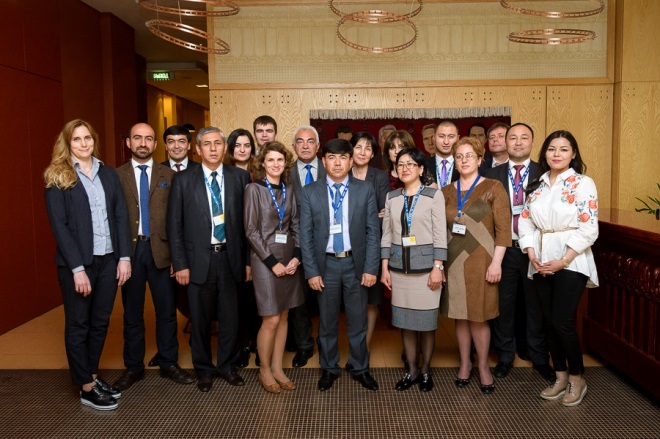 Eurasian Patent Office specialists participated in (i) an extended session of the IRC presidium, 17 March 2017, focused on the judicial practice of litigating Rospatent's decisions on utility model protection, and in (ii) an open session of the IRC Board of Scientific Advisers, 28 April 2017, to tackle typical theory and practice underlying liability of information intermediaries' leveraging intellectual property results and intellectual property designations on the Internet. Headed by EAPO President S. Tlevlessova, a delegation of the Eurasian Patent Office participated in a roundtable discussion of IP mediation in Russia, 6 December 2017. The organizers were Moscow’s International Trade Center and the Russian Federation Chamber of Commerce and Industry. The participants looked at prospects for mediation to evolve in Russia as an institution for resolving IP cases; they discussed initiatives to promote mediation and made an overview of WIPO experience in leveraging alternative IP dispute resolution. 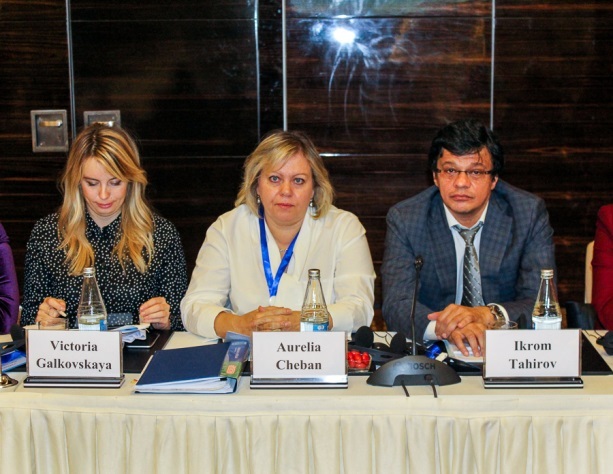 On 6 December 2017, a Eurasian Patent Office representative shared a roundtable on “EAEU’s Common Market of Pharmaceuticals: From Development to Enforcement” as part of the 4th Eurasian Economic Congress. 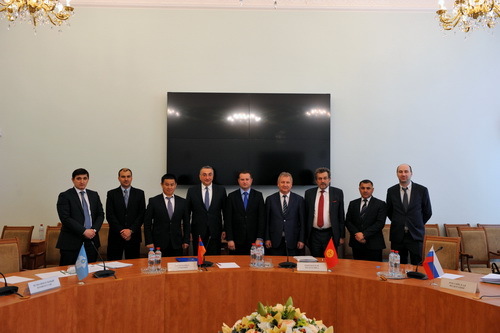 The attending representatives of the Association of International Pharmaceutical Manufacturers (AIMP) and the Eurasian Economic Commission discussed topical issues of regulating the circulation and registration of pharmaceuticals to manage the advancement of EAEU’s pharmaceutical market. Patent protection for pharmaceuticals in the EAEU common market was a separate subject for discussion. Trends in information technologies directly impacting both the performance of the Eurasian Patent Office and intellectual property at large are also in the focus of EAPO attention. On 25 October 2017, Eurasian Office specialists participated in Skolkovo Cyberday 2017, an international conference on cyber security technologies held at the Skolkovo Innovation Centre. The participants became familiar with today's information security challenges and formed an understanding of the dominant trends in technologies for enhancing security of information systems and information as such. With Rospatent among the organizers, the International Conference “Crypto Currency and Other Blockchain Products as Intellectual Property Subject Matters” was held on 6 December 2017. Headed by EAPO President S. Tlevlessova, a Eurasian Patent Office delegation participated in the plenary session looking at intellectual property in the digital age. The participants sought points in common for blockchain technologies, crypto currencies and intellectual property. The session speakers explored prospects for implementing and using blockchain technologies in Russia. Other discussions rotated around opportunities for patenting subject matters based on blockchain technologies and for using blockchain in intellectual property, including patent office operations. The year 2017 saw further momentum added to the Eurasian Patent Office intellectual property cooperation with international and regional organizations. 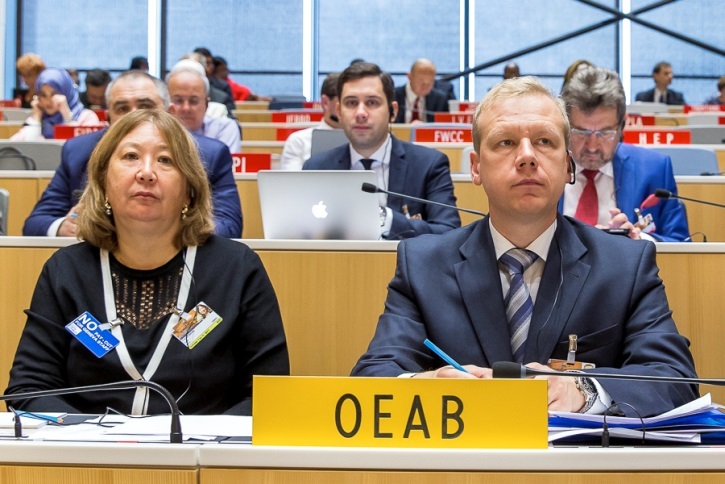 As a permanent observer attending official sessions of the WIPO Member States, the Eurasian Patent Organization interacts with WIPO for advancing intellectual property initiatives in a number of important areas. One of those is collaborative work done within the Committee on WIPO Standards (CWS). Held in 2017, the Fifth Session of the CWS adopted “WIPO Standard ST.27 – Recommendation for the Exchange of Patent Legal Status Data”. EAPO specialists had been part of the Task Force drafting it. By way of implementing WIPO ST.27, the Eurasian Patent Office prepared and dispatched to WIPO in the reporting year information about the events of the standard mapped to the events in relevant EAPO announcements and notified WIPO about the completion of the Russian translation of the standard. As another major step forward, the Fifth Session of the CWS adopted WIPO Standard ST.37 formalising requirements for national registers of patent documents published by national IP offices. Once implemented, WIPO ST.37 will govern the assessment of patent collection completeness within EAPATIS based on the registers completed by IP offices partnering with the Eurasian Office for data exchange. Also, the Fifth Session of the CWS launched a new initiative aiming to standardize the names of applicants and patent owners. Attaching paramount importance to the issue and relying on its abundant experience in Latin-to-Cyrillic transliteration for names and designations, the Eurasian Patent Office is planning to join the efforts of a relevant WIPO Task Force. In December 2017, the Eurasian Patent Office dispatched to WIPO its completed compliance questionnaire on the implementation of WIPO standards. In 2017, Eurasian Patent Office representatives attended also the Twenty-Sixth and Twenty-Seventh Sessions of the Standing Committee on the Law of Patents, the Twentieth Session of the Committee on Development and Intellectual Property and the Tenth Session of the Patent Cooperation Treaty (PCT) Working Group.. 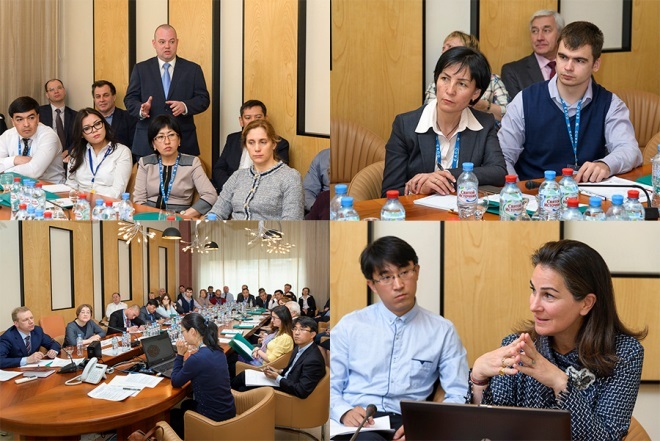 The Eurasian Patent Office delegation met with relevant staff from the Department for Transition and Developed Countries, WIPO, for holding joint events in 2018, such as an ordinary meeting of the EAPO Administrative Council in Tajikistan and regional seminars to be run in Azerbaijan and Tajikistan. EAPO President S. Tlevlessova took the bilateral cooperation issues further in her brief meeting with WIPO Director General F. Gurry in the sidelines of the World Congress, Sydney, Australia, October 2017. 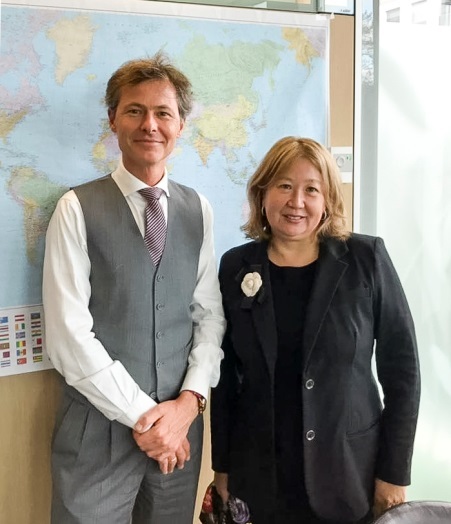 Based on the arrangements achieved in the sidelines of the WIPO Assemblies, EAPO President S. Tlevlessova met with Mr G. Bisson, Director, Hague Registry, Brands and Designs, and other WIPO staff dealing with industrial design protection, 6 November 2017. The parties focused on building and managing individual components of a prospective Eurasian system for industrial design protection and certain initiatives as part of the endeavor. Specifically, they agreed on WIPO’s participation in a face-to-face meeting of the EAPO working group (January 2018) to advance the development of a Eurasian system for the protection of industrial designs. A Eurasian Patent Office delegation visited WIPO, 12-13 December 2017, aiming to learn best practice of the Hague Registry and details of accession to the Hague System for the International Registration of Industrial Designs. The hosting party representatives included Mr Grégoire Bisson, Director, Hague Registry, Brands and Designs, leaders and staff members of units integral to the Hague Registry, representatives of WIPO’s Office of the Legal Counsel, Brands and Designs Sector, Department for Transition and Developed Countries. The itinerary of the learning visit had been developed by WIPO to capture the need for an evolving Eurasian regional system for protecting industrial designs to be properly aligned with the international system for registration of industrial designs. With due account of different legal approaches current in the EAPC Member States and with a view to reaching common ground with all those countries, the WIPO specialists recommended that a viable system be put in place to enable interested parties to manage the invalidation of industrial design patents. Also, the WIPO representatives mentioned agencies authorised to adjudicate the protectability of industrial designs under the emerging regional system and to provide leeway for introducing an opposition procedure as part of industrial design registration. Accession to the WIPO Digital Access Service for Priority Documents (WIPO DAS) marked a new trend in Eurasian Patent Office cooperation. This means that, effective from 1st November 2017 Eurasian applications go from the Eurasian Office to WIPO, if so solicited by the applicant, to be added to the WIPO DAS digital library. The applications, so deposited, are available, however, to the Eurasian Office as prior applications where priority for a Eurasian application is claimed. In the lead-up to the accession, Eurasian Office specialists and technical staff had benefited from a WIPO training workshop on managing WIPO DAS, 27 June 2017. Organized either by the Eurasian Office or WIPO, regional seminars and education events are traditional forms of EAPO/WIPO cooperation. As in the preceding years, the reported period saw WIPO instructors recruited for EAPO-managed professional development training to benefit national IP Offices of states party to the EAPC. P. Waring, O. Novikova and L. Mailänder, WIPO Patents and Technologies, spoke about the Patent Cooperation Treaty (PCT) – commonly referred to as the PCT System, WIPO’s information resources within the PCT and best practice in making use of examination results delivered by examiners of third-party industrial property offices. 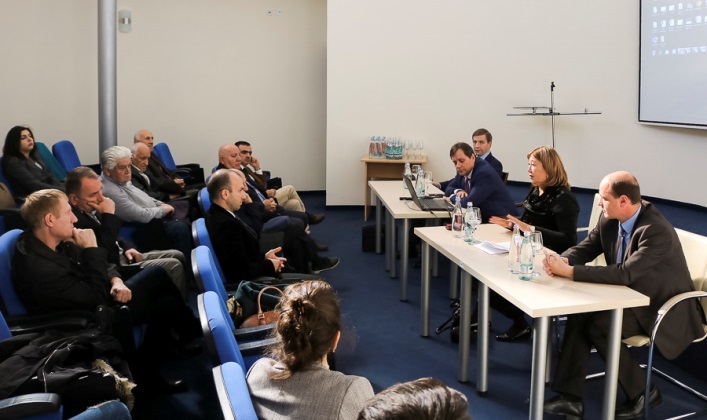 Led by EAPO President S. Tlevlessova, a Eurasian Patent Office delegation shared a regional seminar on national and international patent systems, electronic application filings and patent procedures. Organized jointly by the Intellectual Property Agency of the Republic of Uzbekistan and the World Intellectual Property Organization, the seminar was held in Tashkent, Uzbekistan, 17-18 May 2017. The Eurasian Office instructors spoke about the Eurasian patent system, the benefits of regional patenting and the basics of electronic workflow management under the Eurasian patent procedure, including electronic products and services that the Eurasian Patent Office offers applicants and public at large. Representatives of the Eurasian Office as well as the patent offices of Russia, Korea, Japan, Azerbaijan, Kazakhstan, Ukraine and Uzbekistan presented R&D products, including electronic tools for filing, publication and management of corporate procedures. The Eurasian Patent Office participated in a regional seminar on Patent Law Treaty (PLT) provisions and implementation organized by WIPO and the State Committee on Standardization, Metrology and Patents of the Republic of Azerbaijan, Baku, Azerbaijan, 28-29 November 2017. The seminar tackled in detail the provisions of the Patent Law Treaty and the practice of its implementation in countries party to the PLT. A Eurasian Patent Office participant made an overview of PLT application with a focus on preventing the loss of rights by applicants and patent holders. Also, the speaker dwelt on the EAPO's PLT implementation practice at legal and day-to-day level. The launch of the Patent Prosecution Highway (PPH) Pilot Programme under the roadmap of cooperation between the two offices for 2016-2018 proved a major landmark in the EAPO/EPO collaborative work. 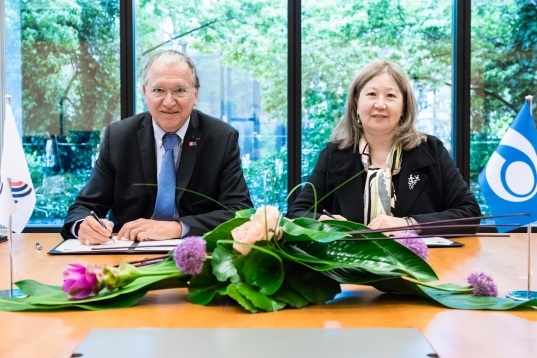 EAPO President S. Tlevlessova and EPO President Benoît Battistelli signed the Memorandum of Understanding on the Patent Prosecution Highway (PPH) Pilot Programme in the course of the EAPO delegation’s visit to the EPO headquarters in Munich, Germany, 27-28 April 2017. Kicked off to run for three years, with room for renewal subject to agreement between the parties, the PPH Pilot Programme enables EAPO/EPO applicants, rendered a positive opinion for their applications at either office, to use fast-track examination procedures at the other office subject to compliance with the Programme provisions. Another significant landmark was the implementation of the Memorandum of Understanding between the Eurasian Patent Office (EAPO) and the European Patent Office (EPO) on Cooperative Patent Classification (CPC) signed by the two parties in October 2016. The Memorandum provides that the Eurasian Patent Office is to commence classifying newly published Eurasian patent documents under the CPC on 1st January 2019 and retrospective documents, on 1st January 2020. Organized by the EPO and the United States Patent and Trademark Office (USPTO) in Geneva, Switzerland, 20 February 2017, the fourth Cooperative Patent Classification annual meeting with National Offices was the venue for an EAPO representative and an EPO team to discuss CPC implementation issues. The EAPO representative became familiar with an EPO-proposed roadmap for CPC implementation by the Eurasian Office. The parties' technical teams communicated electronically with each other to tackle CPC technicalities throughout the reporting year. 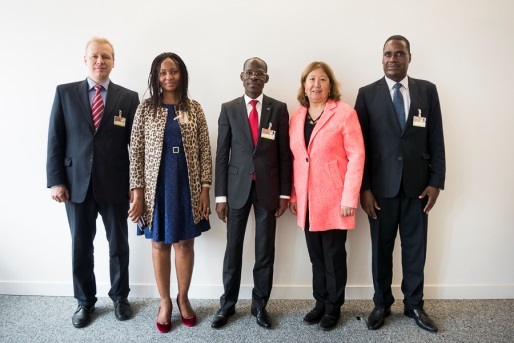 The EPO was the forum for the first meeting of the EPO/EAPO CPC Implementation Group in the course of an EAPO delegation's visit to the European Office in April 2017. The session discussed details of mainstreaming the CPC, relevant training programmes for EAPO staff, classification management, quality assurance, data exchange and a timeline for subsequent meetings of the Group. A Eurasian Patent Office examiner took part in a CPC training workshop at the European Patent Academy, The Hague, Netherlands, 30 May through 1 June 2017. Mr Frédéric Lequeux, an EPO instructor, delivered the first training workshop on CPC basics at the EAPO headquarters, 20 June 2017. The audience became familiar with the CPC structure, basic classification scheme and components as well as specificities of CPC application in different areas of technology. The workshop exercise focused on principles of classification and techniques the examiners use on the ground. The roadmap for CPC implementation at the Eurasian Patent Office in 2018 envisages a series of advanced training workshops on using the classification in different fields of technology. 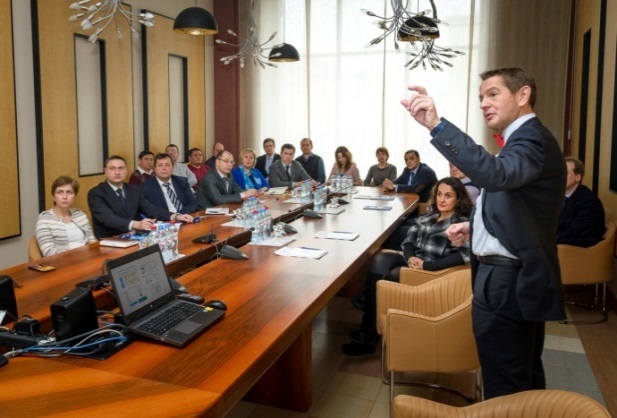 Mr P. Skorovs, an EPO patent examiner, instructed specialists from national IP Offices of EAPC Member States in a series of seminars organized by the Eurasian Patent Office in the autumn of 2017. The audiences became familiar with practical examination of applications for medical equipment patent protection, the Cooperative Patent Classification (CPC) system and CPC-driven patent search strategies in the medical technology sector as an example. EAPO participation in conferences, training workshops and other events organized by the EPO at the European Patent Academy is a traditional format of the EAPO/EPO teamwork. Eurasian Patent Office examiners tackled practical patenting in pharmaceuticals in a training workshop held by the European Patent Academy, Munich, Germany, 4-6 November 2017. Eurasian Patent Office specialists attended the 27th European Patent Office Patent Information Conference (EPO PIC), Sofia, Bulgaria, 7-9 November 2017. The conference focused on latest trends in the use of patent data relying on cutting-edge information technologies. In the sidelines of the EPO PIC, the EAPO team met with their counterparts from the EPO and the national IP Offices of Ukraine and Moldova to discuss patent information exchange. Eurasian Patent Office representatives participated in the "Boards of Appeal and key decisions" conference held by the European Patent Academy, Munich, Germany, 22-23 November 2017. The conference provided a unique insight into the EPO's case law practice. The programme included mock trial proceedings before a board of appeal. In the sidelines of the conference, the EAPO representatives exchanged views on application processing practice with attending patent attorneys and specialists from national IP Offices. 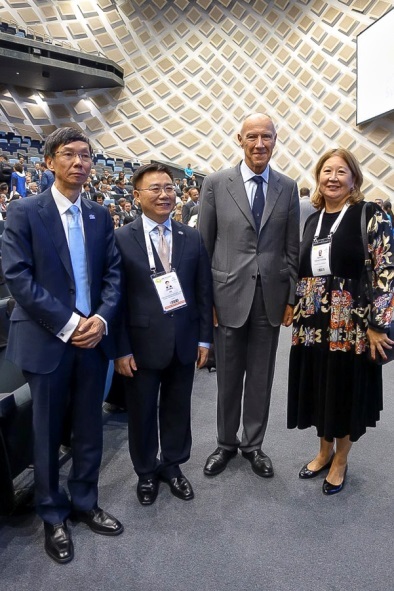 Headed by EAPO President S. Tlevlessova, a Eurasian Patent Office delegation participated in the International Association for the Protection of Intellectual Property (AIPPI) World Congress, Sydney, Australia, 13 – 16 October 2017. The congress delegates discussed and developed a number of IP-related resolutions that tackled, inter alia, patentability of computer-implemented inventions, striking a balance between fostering creativity and limiting competition, etc. Specialist sessions of the Congress made good progress with a resolution passed on patenting genes and genetic materials, which is expected to harmonise law and practice in this area at national and international level. Apart from attending the Congress events and learning more about AIPPI operations, the EAPO delegation had brief meetings with WIPO Director General Francis Gurry, SIPO Deputy Commissioner He Zhimin, AIPPI Secretary-General-elect Olga Sirakova, as well as representatives of the European Patent Office, African Regional Industrial Property Organization (ARIPO) and patent attorney firms from different countries. Ms Han Mi-Young, President, World Women Inventors and Entrepreneurs Association. The two presidents took stock of the collaborative work done in the reported year and looked at prospects for cooperation between the organizations in the following year. The EAPO delegation had a meeting with Mr Javier Moreno Ramos who is in charge of International Relations, European Union Intellectual Property Office (EUIPO). The parties looked at the development of cooperation between the two offices to include exploring the EUIPO experience in the protection of industrial designs at the regional level and relying on EUIPO IT support for accessing EUIPO databases for managing industrial design examination. EAPO representatives participated in international conferences organized by international IP associations. Those included an annual conference of the International Trademark Association (INTA), Barcelona, Spain, 20-24 May 2017, and the 9th Annual International Conference “BRICS IP Forum 2017”, Paris, France, 30-31 October 2017. In his address to the BRICS IP Forum 2017, the EAPO representative spoke about the benefits of the regional patenting system for protecting investments in Eurasian patent space, latest trends in EAPO development and core areas of the Eurasian Office operation. In the sidelines, forum delegates exchanged views on IP enforcement practice in BRICS countries, substantive examination of Eurasian applications and the validity of the Eurasian patent upon grant. The year 2017 saw a major boost to the growth of cooperation with patent offices and professional associations in Asia. 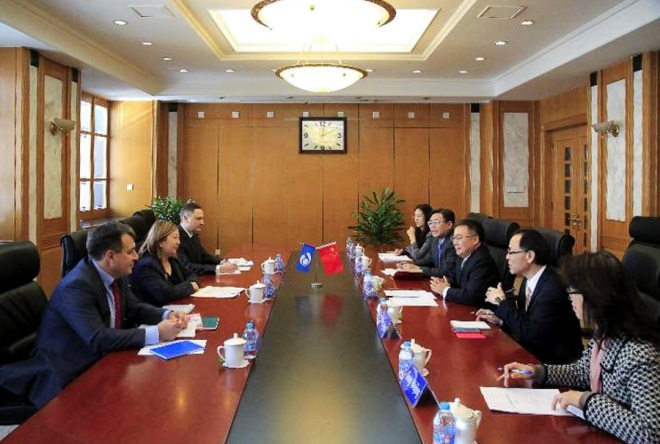 Led by EAPO President S. Tlevlessova, a delegation of the Eurasian Patent Office visited the State Intellectual Property Office of the People’s Republic of China. 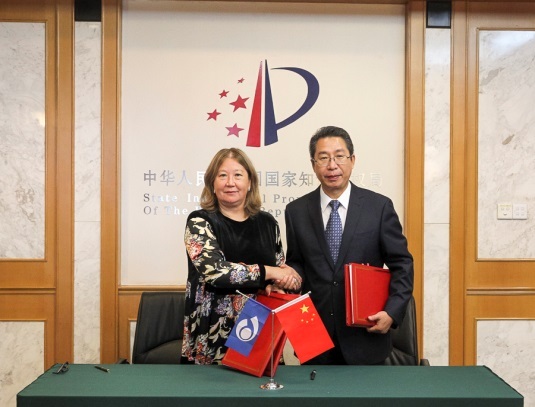 EAPO President S. Tlevlessova and SIPO Commissioner Shen Changyu affixed their signatures to the Memorandum of Understanding on Patent Prosecution Highway (PPH) Pilot Program and the Intellectual Property Data Exchange Agreement, 4 September 2017, which marked a major advancement in EAPO/SIPO cooperation. With effect from 1st April 2018, the Patent Prosecution Highway (PPH) enables applicants, filing with the EAPO and SIPO, to benefit from a fast track examination procedure subject to a positive opinion rendered by the counterpart office. The Intellectual Property Data Exchange Agreement sets standards for the structure and format of data exchange between the Eurasian Office and SIPO. The agreement provides for regular contributions to EAPO/SIPO databases of latest patent document information published by either office. As part of the visit itinerary, EAPO President S. Tlevlessova and SIPO Commissioner Shen Changyu held talks to take stock of the current cooperation between the two offices, their latest key performance indicators and the implementation of effective EAPO/SIPO agreements. Also, the parties looked at prospects for furthering the exchange of experience and best practice between the two offices’ examiners, plus the reciprocal participation in the counterpart office's conferences, seminars, etc. Further to the EAPO/SIPO accords in place, Eurasian Patent Office examiners benefited in 2017 from instructions on and tapping into the Cloud Patent Examination System that holds examination opinion documents and application dossiers of SIPO and some other IP offices leading in industrial design. Listed below are the initiatives implemented in team with the Chinese counterparts in 2017. SIPO professionals delivered lectures at a seminar on patent landscapes and at a training workshop on examination in chemistry, medicine and biotechnologies run at the Eurasian Patent Office for national IP Offices in May 2017. 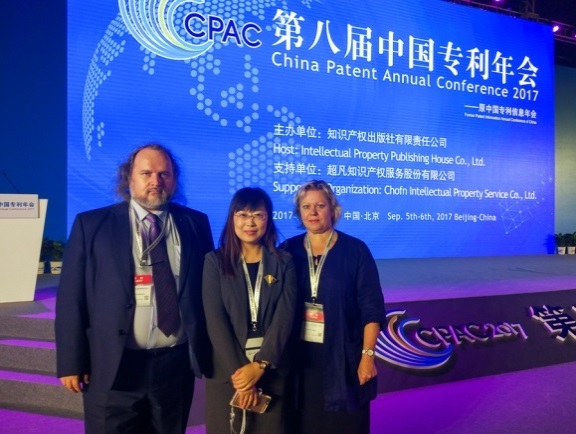 Invited by SIPO, a delegation of the Eurasian Patent Office took part in an open session of CPAC 2017, an international annual patent conference, Beijing, P.R. China, 5-6 September 2017. Focused on patents as real economy drivers, CPAC 2017 drew participation of more than eight thousand delegates to exchange experience in strategies for administering IP rights and to see how they impact the commercial capacity of engineering companies and manufacturers. CPAC’s open session welcomed the opportunity for participating IP offices to enhance cooperation in the field of intellectual property (IP) and to promote innovation. The Conference took place in the context of China’s “One Belt, One Road” initiative which seeks closer connectivity among countries. In a SIPO-moderated dialogue, the participating IP office delegates from Hungary, Czech Republic, Turkey, Singapore and the EAPO shared their country and regional experience and know-how in enhancing efficiency and quality of examination as well as in leveraging patent system user access to information products and IP office resources. On 9 October 2017, a Eurasian Patent Office delegation and representatives of some Eurasian patent attorney law firms visited Beijing Sanyou Intellectual Property Agency Ltd, a Chinese market leader in providing IP right protection services. The purpose of the visit was to promote the benefits of the Eurasian patent procedure and EAPO electronic service capability. Headed by EAPO President S. Tlevlessova, a Eurasian Patent Office delegation paid a second visit to China, 20-22 December 2017. EAPO President S. Tlevlessova and SIPO Commissioner Shen Changyu expressed satisfaction with the level of collaborative work done so far and reiterated their interest in enhancing cooperation. The parties agreed to sign a new memorandum between the EAPO and SIPO to supersede the effective memorandum signed in 2007. The parties took the accord further and scheduled Mr Shen Changyu’s visit to the EAPO headquarter in the latter half of 2018. The EAPO delegation held talks with SIPO Deputy Commissioner He Zhimin on the implementation of the Memorandum of Understanding on Patent Prosecution Highway (PPH). The parties looked at groundwork to do in the lead-up to the programme launch on 1st April 2018 and set priority objectives, including mutual account of search and examination results of the application review process as well as on-line data interchange to be established between the offices. For more specific cooperation steps, the parties agreed to draft a biennial work plan and sign it in the former half of 2018. The two offices discussed anchor initiatives, such as the exchange of experience in providing industrial property protection, as part of joint training workshops for examiners and regional outreach events to be organized by either party to promote intellectual property. The parties agreed on EAPO representatives' participation in conferences part of the “One Belt, One Road” initiative, CPAC 2018 as an annual patent conference and other SIPO-sponsored fora, symposia, seminars and meetings with patent attorneys. The Chinese counterparts reiterated their commitment to participation in EAPO events. The Eurasian Patent Office delegation had an overview of SIPO practice in providing legal protection for industrial designs, SIPO steps towards the accession to the Hague Agreement Concerning the International Registration of Industrial Designs and specificities of examining applications for inventions in the field of blockchain technologies. In the course of the visit and in conformity with the EAPO/SIPO Intellectual Property Data Exchange Agreement signed in 2017, the Eurasian Office delivered to SIPO the entire retrospective collection of published Eurasian applications and Eurasian patents. As part of the visit itinerary, the Eurasian Patent Office delegation participated in the ceremony of awarding medals to Tsinghua University and NUCTECH Company Ltd that had jointly filed the 50,000th Eurasian application. 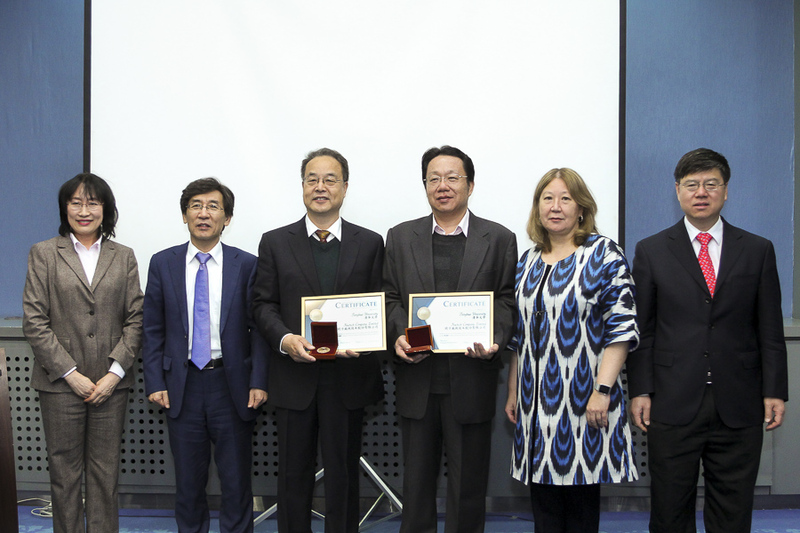 Held at Tsinghua University, the ceremony drew attendance from the corporate recipients of the award, SIPO representatives and patent attorneys from China Science Patent & Trademark Agent Ltd. (CSPTAL). In the course of a tour of Tsinghua University, the Eurasian Patent Office delegation visited two physics engineering laboratories where the researchers use different-branded particle accelerators and join forces, inter alia, with NUCTECH Company Ltd for equipment development. The year 2017 saw further advancement of IP cooperation with organizations in the Republic of Korea. EAPO President S. Tlevlesova visited South Korea, 17-22 June 2017, at the invitation of President Han Mi-Young, World Women Inventors and Entrepreneurs Association (WWIEA). The EAPO President shared the award ceremony for the finalists in the Second Korean International Youth Olympiad 4I 2017 “Ideas, Inventions, Innovations, Intellectual Property” organized by WWIEA. In the course of the visit, the Eurasian Office and WWIEA took stock of cooperation so far and looked into the future for furthering their collaborative action. Also, Saule Tlevlessova and Han Mi-Young briefly touched upon bilateral cooperation in the sidelines of the WIPO Assemblies, October 2017. Cooperation with the Korean Intellectual Property Office (KIPO) in 2017 was driven by the Korean counterparts’ interest in tapping into the EAPO information resources. In the former half of the reporting year, relevant specialists of the two offices looked into each other’s corporate information product line and discussed technicalities of patent data exchange. The yield of the exercise was an EAPO/KIPO Draft Agreement on Intellectual Property Data Exchange that is currently in the pipeline. Collaboration with intellectual property offices of states not party to EAPO in post-Soviet space is an important commitment for the Eurasian Patent Office in promoting the Eurasian patent system to connect it with ever-growing audiences. 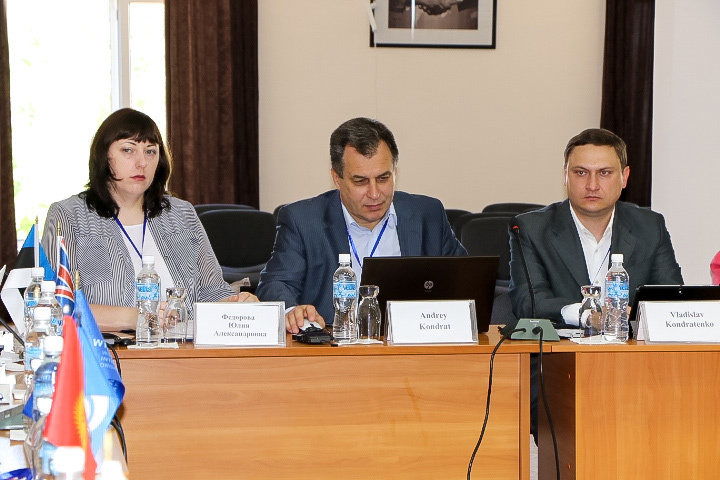 Representatives of the Eurasian Patent Office took part in a series of events organized by the State Agency on Intellectual Property of the Republic of Moldova (AGEPI) in Chisinau, Republic of Moldova. 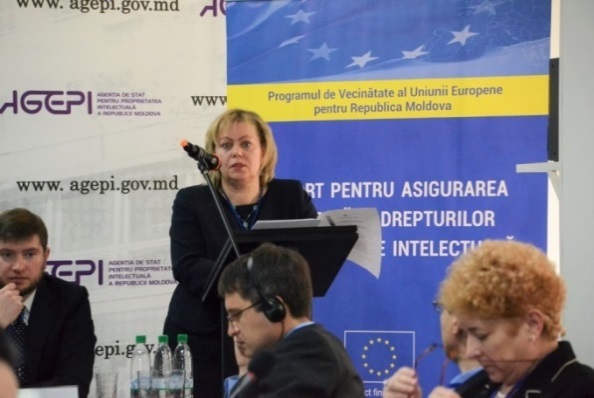 Those included the "AGEPI Readings" Symposium as part of the World Intellectual Property Day events and the quarter-of-a-century celebrations of AGEPI and the establishment of Republic of Moldova intellectual property system. Headed by EAPO President S. Tlevlessova, a Eurasian Patent Office delegation paid working visits to the National Intellectual Property Centre of Georgia Sakpatenti in May and November 2017. In the course of talks and a working meeting with the Sakpatenti executives and Georgian patent attorneys, the EAPO delegation spoke of the benefits and the principles underlying the regional patent protection of inventions in Eurasian patent space; they also gave an overview of Eurasian Office current initiatives to advance the Eurasian Patent Organization. In the sidelines of the WIPO Assemblies, October 2017, EAPO President S. Tlevlessova had a brief meeting with Mr M.I. Titartchuk, Deputy Minister of Economic Development and Trade of Ukraine, and Mr A.V. Kudin, Director General, Ukrainian Institute of Intellectual Property (Ukrpatent). The parties expressed interest in developing bilateral cooperation. 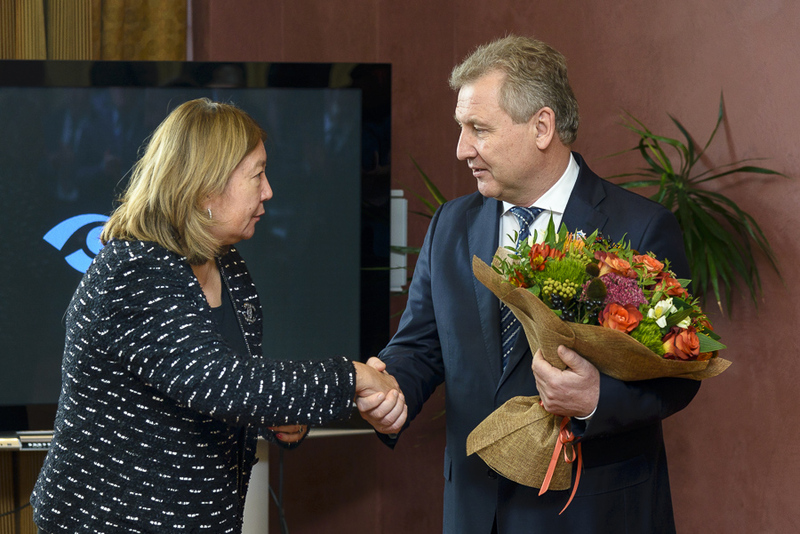 EAPO President S. Tlevlessova had a meeting with Director General A.N. Fayzullaev, Agency on Intellectual Property of the Republic of Uzbekistan, in the course of a regional seminar in Tashkent, Uzbekistan, 17-18 May 2017. The two leaders took stock of their corporate performance so far and looked into the future for enhancing collaborative action. Representatives of major industrial concerns, corporations and corporate IP information providers paid visits to the EAPO headquarters in 2017 to learn more about the two IP agencies and to look at cooperation opportunities. 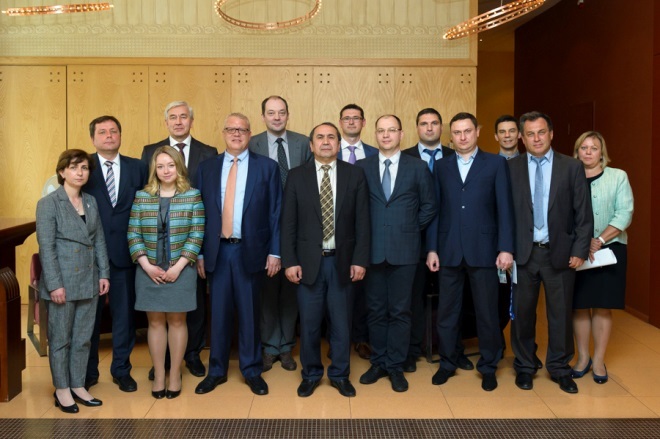 A delegation of ThyssenKrupp Intellectual Property GmbH, a division of ThyssenKrupp, Germany, visited the Eurasian Patent Office in February 2017. Headed by CEO Dr. Stephan Wolke, the ThyssenKrupp Intellectual Property GmbH team made an overview of their industrial property strategies, discussed with EAPO President S. Tlevlessova specificities of protecting inventions in Eurasia, looked at the statistics of ThyssenKrupp applications filed and sketched out some possible future paths for collaborative action between the Eurasian Office and ThyssenKrupp. 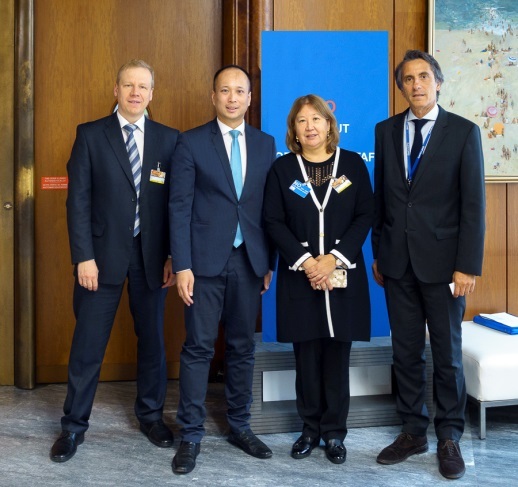 Essen, Germany, was the venue of a working meeting in July 2017 for representatives of the Eurasian Patent Office and Eurasian patent attorney firms with leaders and staff of ThyssenKrupp AG structural units dealing with IP protection. The purpose of the visit was to learn more about the hosts’ industry operation specificities, practice of preparing patent applications, corporate approaches to developing and managing industrial property assets in such sectors as industrial chemistry, steelmaking, engineering, electric equipment and steering systems. To reciprocate, the Eurasian Office representatives responded to queries on the Eurasian patent procedure and EAPO operations. A delegation of Japan Patent Data Service Co., Japan's largest patent document provider, visited the Eurasian Patent Office in April 2017 to explore opportunities of acquiring EAPO's collection of patent documents and forming a technical understanding of accessing EAPO patent information. 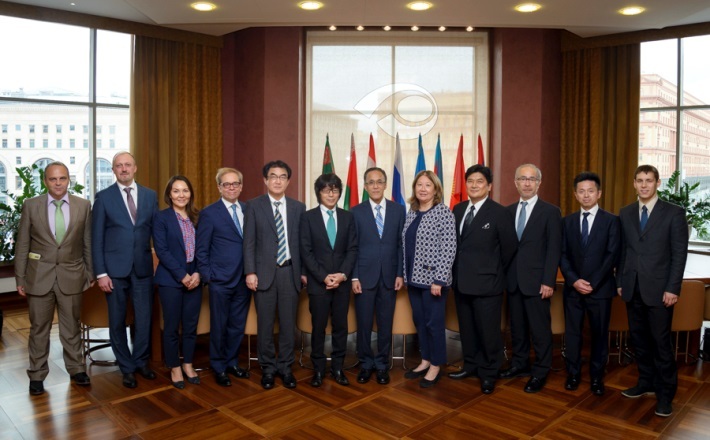 Representatives of the Japan Business Machine and Information System Industries Association (JBMIA), Gowling WLG International Inc. and Johnson&Johnson Services Inc. visited the Eurasian Patent Office in June 2017. Eurasian Patent Office specialists spoke about the benefits of the Eurasian patent system, EAPO key performance indicators, presented their line of products and services and responded to the guests' queries. A Eurasian Patent Office representative made a presentation on the Eurasian patent system at a seminar organized by De Simone & Partners S.p.A, Rome, Italy, December 2017. The audience showed intense interest in sections of the discourse dealing with substantive examination, opposition and appeals procedures, Eurasian patent infringements and the judicial practice in challenging Eurasian patent validity in countries party to the EAPC.